Madrasah Kukeldash, Architectural monuments of Tashkent, Madrassahs of Tashkent, Sights of Uzbekistan, Sights of Tashkent. Madrasah Kukeldash is one of the biggest madrassah of old Tashkent, was built not later than 1569 by the minister of Tashkentsheibanid sultans Barak-khan and Dervish Khan, who was named “kukeldash”. In the plan the building is a rectangular courtyard. The main portal, which height is 19, 7m leads to a courtyard, surrounded by hudjras. Each portal consists of a room and entrance niche – aivan. The portal was damaged after two earthquakes but it was rebuilt in 1950-1960 years. Many years madrasah Kukeldash was the main centre of the city, also there was trade square and carevanserais, the citizens came to hear the news. Nowadays as it was four centuries ago, there are madrasah and the mosque, calling people to prayer. The students also live and study here. Unfortunately the original appearance of this huge building was not preserved because of numerous repairs. 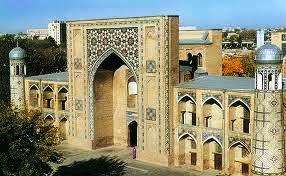 In spite of this, in size it is not inferior to the famous madrasahs of Samarkand and Bukhara. Madrasah Kukeldash is one of the first medieval architectural monuments of the city, which preserved to the present day.